Bhills are considered as one of the oldest tribe in India. Once they were the ruler in parts of Rajasthan, Gujarat, Malwa, Madhya Pradesh and Bihar. They are a cross section of great Munda race and a wild tribe of India. Bhills could be identified as one of the Dravidian racial tribe of Western India and belong to Austroloid group of tribes. They speak a language of Dravidian origin. In Tripura total Bhill population is 3,105 as per 2011 Census. 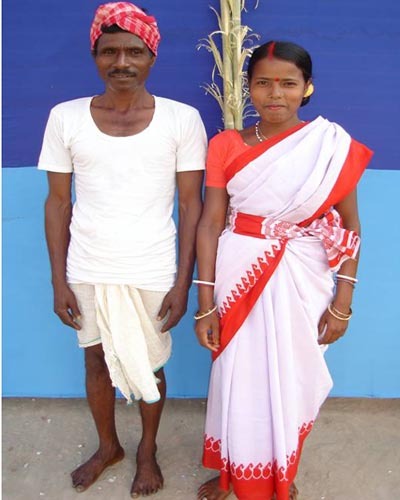 This tribe has migrated to Tripura from central India mainly from Bihar and Madhya Pradesh. Their economy is centralized with Tea garden, Brickfield and Agriculture. Their major concentrations in Tripura are mainly in Akinpur of Belonia, Bagan Bazar of Khowai Sub-Division. They are also found in North Tripura working in Tea gardens. Bhills are Hindus by religion. They appease deities of forest and evil spirits beside pujas of Lord Shiva and Durga. Small percentages among them follow Christianity. They cremate their dead followed series of rites as per their traditional customs and believe. Bhills are also fond of dance and music with traditional tune of Flute and Drum. In all family and community ceremonies they enjoy whole night by drinking and dancing. Bhills in other part of the country are well literate and enjoy modern weave of life.